Only the silence of a peasant and his bullock in the noonday field. Yet he kept his back turned. In a mile of sunlight. Once again afternoon fades into estuaries. 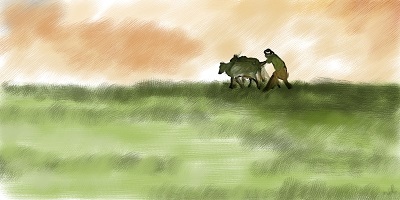 The field with his bullock. Stretch over Bengal's barren tracts of land. Daylight hours here—and for this era—are over now. But is it really nineteen forty-two? He holds no hope of peace nor passion anywhere. He was born; he will die one day. He had come to the field with the rising sun. He slept soundly, for he knew the sun would rise again. On an unturned plot, true or false? Finds no relief as yet. With its cracks and fissures of an April field. There are no more promises. And even then, not like gold. To the tune of its own waters. From a comedy of errors in a sea overspread with blue? For the first and final man in common mankind's light of sun. "খেতে প্রান্তরে"/"In Fields Fertile and Fallow ," published in Nirukta (নিরুক্ত), June, 1942; included in Darkness of Seven Stars (সাতটি তারার তিমির). Naciketa is associated with fire; he learns the magical mantra of Agni (fire) from Yama, lord of the dead. Praceta, on the other hand, is one of the many names for Varuna, lord of all waters, lord of the seas.